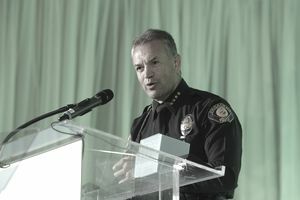 A police chief is a very visible leader in city government. The chief oversees the operations and budget of the police department and is therefore praised for successes and held responsible for failures. Generally, when a police chief position becomes vacant, the city hires an executive search firm to complete at least some of the recruitment and screening tasks in the hiring process. Usually, the company advertises the position, looks for qualified candidates and encourages those individuals to apply. It may perform other tasks as outlined in its contract with the city. In the strong mayor form of government, the police chief reports to the mayor, so the mayor has the final decision on the selection of the new chief. In the council-manager form of government, the chief reports to the city manager. No matter who is the chief’s boss, the chief keeps that person informed on major issues and potential problems. Under both systems, a wise mayor or city manager will solicit input from other city staff and the community regarding the hire. The police chief is a high-profile position, and the public should be confident in the individual selected. Finalists may be interviewed by panels of citizens as part of the interview process. They may also be forced to attend public forums where individual citizens can ask them questions. The scene is much like a town hall meeting held by a politician. Police chiefs should have at least a bachelor’s degree, and many cities require or prefer a graduate degree. Many police officers have a bachelor’s degree in criminal justice. If an officer wants to one day become a chief, the officer should consider a master of public administration or master of business administration to round out his or her education in a way that aligns with the leadership and management duties of a police chief position. Individuals become police chiefs toward the middle and end of their careers. Chiefs have extensive, progressively responsible experience in law enforcement. That experience can include service in state and federal police forces. It must include service in a local police force like a sheriff’s office or city police department. As the top manager in a police department, the chief has final say on all hiring, firing and promotion decisions. Lower level managers provide recommendations on personnel decisions that must be approved by the police chief or a highly trusted designee. A police chief in a large department may have thousands of officers under his or her line of supervision, all of them putting their lives at risk protecting the community. New police chiefs are often surprised by the time demands the job places on them. City council meetings, volunteer meetings, luncheons, charity events, and emergency situations often happen outside regular business hours. Officer-involved shootings, major crimes, and other emergencies can pull a chief from bed at 3:00 a.m. to deal with superiors, subordinates and the media. Even though police departments usually fare better in the budget process than other city departments, managing a police department budget is difficult because of the many competing priorities. Departments must maintain a 24-hour a day presence on the streets, purchase expensive equipment like patrol cars and weapons, and fund prevention programs. Allocating funds for these and other competing priorities requires vision, strategy and excellent communication skills. The chief is the department’s public face. Officers look to the chief for leadership, so the chief must be a good manager with high ethical standards. The community looks to the chief for answers on crime problems. In crisis situations, the police chief, city manager, mayor, and public information officer are in constant communication ensuring that a consistent message is delivered to the public. Police chiefs may conduct press conferences and take questions from the media. These officials also make sure that only appropriate information is released. Examples include ensuring family members are notified before the name of a murder victim is released by the department and protecting case-related details that could tip off a criminal on how an investigation is going. According to 2018 data, police chiefs typically earn between $96,700 and $108,631. Chiefs in very small department earn less than this range because the cities they serve do not have the financial capacity to pay more. What is the Job of Director of Parks and Recreation Like?